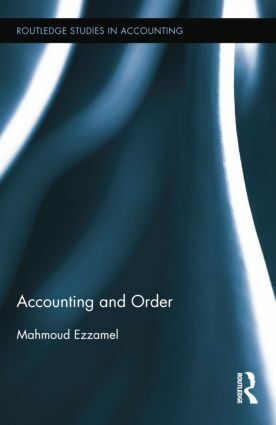 This book draws on ancient Egyptian inscriptions in order to theorize the relationship between accounting and order. It focuses especially on the performative power of accounting in producing and sustaining order in society. It explores how accounting intervened in various domains of the ancient Egyptian world: the cosmos; life on earth (offerings to the gods; taxation; transportation; redistribution for palace dependants; mining activities; work organization; baking and brewing; private estates and the household; and private transactions in semi-barter exchange); and the cult of the dead. The book emphasizes several possibilities through which accounting can be theorized over and above strands of theorizing that have already been explored in detail previously. These additional possibilities theorize accounting as a performative ritual; myth; a sign system; a signifier; a time ordering device; a spatial ordering device; violence; and as an archive and a cultural memory. Each of these themes are summarized with further suggestions as to how theorizing might be pursued in future research in the final chapter of the book. This book is of particular relevance to all accounting students and researchers concerned with theorize accounting and also with the relevance of history to the project of contemporary theorizing of accounting.